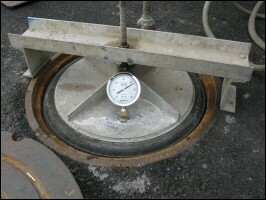 Vacuum testing is required on many manholes around the State of Oregon and Washington. Vacuum testing is conducted to ensure the lack of infiltration as well as ex-filtration. Our company has vacuum tested manholes for years and can provide a great service if you are tired of hydro-testing your manholes or trying to find the leaks in the concrete surfaces. Air testing and Mandreling pipes for our customers. Our testing abilities range from 4 inch to 30 inch pipe. Joint testing is recommended for any pipe over 30 inches. Our "Isolation Gear" is designed to locate leaks underground. If you have a broken Y, loose lateral cap, or slipped joint, we can find it. EXPENSE, HIGH COST AND AGGRAVATION! Leak stopping those gushers and those small weeping cracks and crevices. Our combined 38 years of experience and our superior products ensure both professional service in a faction of the time! Let the professionals do what they do best!